Best known for his role as Tommy Oliver in the long-running TV show Power Rangers, Jason morphed into a series of different rangers over the years: Mighty Morphin Green and White, Red Zeo, Red Turbo, and then returned in 2004 as the Black DinoThunder Ranger. All in all, 'Tommy' appeared in more episodes than any other character, 225 in total, and appeared in both full-length movies, Mighty Morphin Power Rangers The Movie (1995) and Turbo (1997). A highly accomplished and respected martial artist with 34 years experience, Kyoshi Frank currently holds a seventh degree black belt in American Karate and a purple belt in Brazilian Jiu Jitsu. He is the owner/operator of Rising Sun Karate and MMA, with three schools in Texas and one in California. 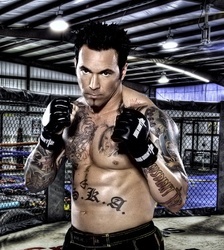 He is also the founder/CEO of Jesus Didn't Tap, the first Christian-based line of MMA clothing and fight gear. Inducted into the World Karate Union Hall of Fame in 2003 as the American Karate Master of the Year, he is the founder of Toso Kune Do, his own style. Beginning his full contact career in 2006, Jason won the prestigious "Ruff Man" Grand Champion title in Indiana and the gold medal in Master Toddy's Full Contact Muay Thai competition in Las Vegas. In 2010, Kyoshi began his amateur Mixed Martial Arts career with a 4-0 record and then in August won his first pro bout. Always an actor at heart, Jason has taken on several small and big screen roles with his most recent being The One Warrior - an action/fantasy film which also stars James Russo and Dominic Keating. In the story, the character of The One Warrior finds himself in a mythical world where he must destroy the Evil Lord Shoukata. However, first he must fight his way through many challenges that include dragons, the cursed swords of Damocles, the Samurai Six, the Amazon Warriors, and much, much more. The movie is scheduled for release very soon.